Spring is cold and breezy this morning. Having vanquished Winter, it has claimed the cold and the wind as its booty. The sun is reluctant, the sky overcast. Mist scurries across Halcyon Pond; small clouds scuterring on the water, eager to join their celestial families, but earthbound by the chill. No frogs sang through the night, they too, thwarted by Springs’s change of heart. I left a tub sitting on the patio, gathering rainwater. Each time I thought of emptying it, I didn’t, a faint “who knows?” holding me back in spite of (or maybe because of) the scum growing on the surface. And now I know.Yesterday I discovered frogs’ eggs. It is a little pond for my frogs…..
Little black eggs riding in their mucus sacs (I think), waiting to turn into tadpoles, who then start growing little back legs and then eventually hop right outta there! I love your commingling of constellations and Rorschach, Jeff. Wouldn’t it be interesting to consider the constellations as a Rorschach test of the civilizations that named them? I spent many an afternoon with my twin brother catching tadpoles in the small creek that ran through the park in front of my grandmother’s house. Half a century later the creek runs silent and unseen deep in a culvert beneath the park in front of my studio. The tadpoles are not forgotten. Tadpoles and children seem to go together, don’t they, Ed? It makes me so sad to think that a park, which should be a place of discovery, is just the opposite. I love your frogspawn. When I lived on the farm we would put some in a jam jar and take it to school to watch the tadpoles hatch. But, beware, as lots of creatures like to eat it! I love the image, Susan. And, I’m sorry to report that when I checked yesterday, something had indeed feasted on the batch. 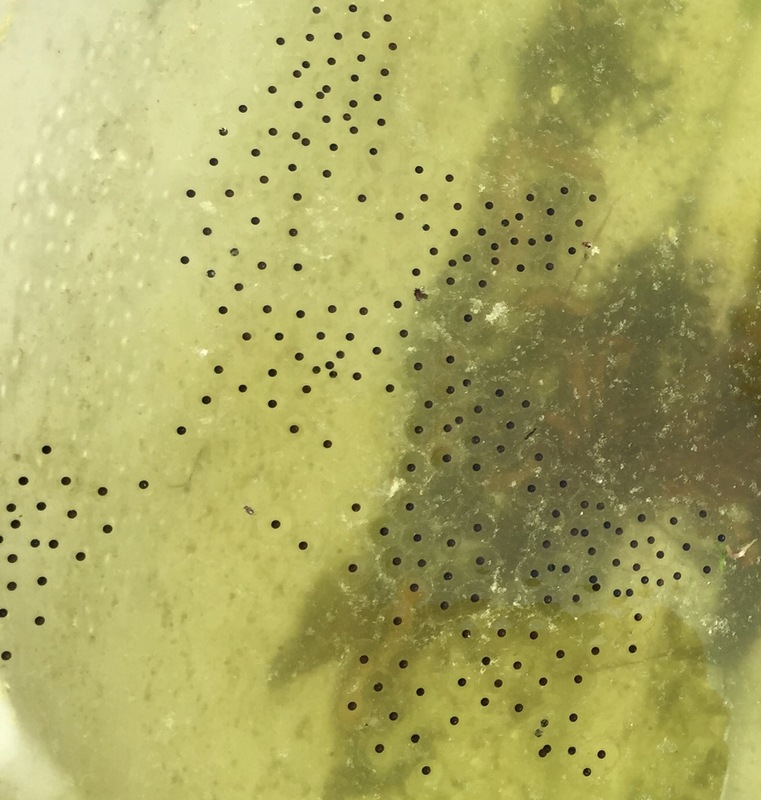 We’re down to about ten eggs, but they’re already developing in tadpoles. I guess all creatures like caviar! This is beautiful. With some accuracy we can determine when the legs will grow and the hopping right outa there begins. I wonder, though, it seems that its much more difficult to find our legs and know when to “hop right outa there;” wherever or whatever there may be. And you’re so right. I wonder if frogs worry where “there” is before they start hopping.